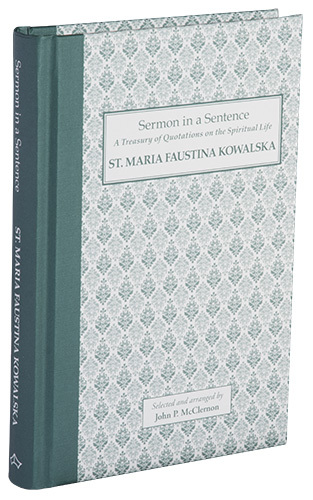 This handy little book contains hundreds of direct quotes and short sayings of St. Maria Faustina Kowalska, arranged according to the Christian virtues and other spiritual topics, allowing the reader to encounter her thoughts about particular aspects of the Christian life in a more organized manner. The first fifteen chapters are arranged under virtues corresponding to the classical Fifteen Mysteries of the Rosary, making this ideal for anyone to use for daily spiritual reading and inspiration. Reading these sayings while reciting the Rosary is like praying it with St. Faustina, joining both prayer and the study of her writings in one great journey of advancing all the more in holiness and the love of God. The visions of St. Maria Faustina Kowalska (1905 � 1938) are the basis for the modern Catholic devotion to the Divine Mercy. Behind the extraordinary phenomena that marked her life was a deep humility and a burning desire to see all of mankind converted to God by the attraction and power of His mercy. More than the visions about the Divine Mercy, what comes through her Diary is the deep spirituality that eventually led her to the heights of sanctity, ultimately resulting in her canonization. The Church and the world have been given a great gift in the person of St. Maria Faustina of the Most Blessed Sacrament. Her spiritual journey into abiding trust is kindly and gently presented in these meditative quotations which are used for the recitation of the mysteries of the Holy Rosary. We Marian Fathers of the Immaculate Conception of the Blessed Virgin Mary are thrilled with this propitious use of the quotes from St. Faustina, particularly since she valued very deeply the gift of the Rosary. Her complete commitment to God is seen through her own living out of the Gospel message: to know God, love God and serve God as a humble and loving child of God. St. Faustina prayed the Rosary daily and even asked permission, as recorded in Diary No 246, to pray the Rosary with arms outstretched. Meditation on the life of Jesus through the mysteries of the Rosary was true food for this mystic. She prayed alone and with others as she heard the voice of God leading her to intercede for the sick, the dying, and the tempted as can be attested in Diary entries, e.g. No 314, 489, 515. This last entry gives a clear purpose for intercessory prayer as we all try to live God�s will � In the evening, when I was walking in the garden saying my rosary and came to the cemetery, I opened the gate a little and began to pray for a while, and I asked them interiorly, �You are very happy are you not?� Then I heard the words, �We are happy in the measure that we have fulfilled God�s will� � and then silence as before. I became introspective and reflected for a long time on how I am fulfilling God�s will and how I am profiting from the time that God has given me. Jesus said, I have come to fulfill the will of my Father � we too live to fulfill the will of our heavenly Father and are helped through our contemplation of His presence and actions in our lives. May your use of these quotes be for you a true �Sermon in a Sentence� and may all you meet receive from you the full gift offered by God, �to be holy and righteous in His sight all the days of your life� as you ponder the mercy of God given us from age to age, realizing that today a full conviction of God�s mercy will be a sure path to His Peace. Imagine spending a few minutes with St. Maria Faustina, the recently canonized �Apostle of Divine Mercy�, whose deep and intimate love and familiarity with Jesus Christ has placed her among the Church�s greatest mystics. Although this cloistered nun was virtually unknown to the world at the time of her death in 1938, she was chosen by Our Lord Jesus Christ to remind the world of the timeless truth of His unfathomable mercy and love for all people. By the end of the 20th century the message of Divine Mercy had spread to all corners of the world. Devotion to the Mercy of God has also reached millions of the faithful through the journal she wrote the last four years of her life � Divine Mercy in My Soul. This book will certainly be ranked among the great Christian spiri�tual classics of all time. Pope John Paul II has added �Divine Mercy Sunday� to the appellations of the first Sunday after Easter in response to the specific request of Jesus Christ as He instructed St. Maria Faustina. The spiritual insights and practical suggestions contained in St. Maria�s writings form a road to personal sanctity and union with Jesus Christ. This book has been designed to bring the inspiration of her writings and reflections to you in a very simple and direct format. Hundreds of short quotations taken from the writings and sayings of St. Maria Faustina have been classified by the Christian virtues of which they speak and then arranged to complement the traditional fifteen-decade rosary, proceeding from the first Joyful Mystery (the Annunciation, with its virtue of humility) to the fifth Glorious Mystery (the Crowning of Mary, with its virtue of devotion to Mary). The optional Luminous Mysteries are also included later in the book for those who benefit from meditation on these events in the life of Christ. We have placed a type ornament after the tenth quote for each mystery, to mark the end of a decade, for those who wish to use these excerpts for mediation while reciting the rosary. Additional quotations follow, for personal devotion and meditation. A selection of quotations on other spiritual topics of interest follows, bringing the reader a sample of St. Maria�s insights into such subjects as Prayer, the Church and the Priesthood. There has also been added a section dedicated to her mission of spreading the knowledge of Divine Mercy, which brings to light the infinite mercy of God, the unique and powerful prayer of the Chaplet of Divine Mercy, the veneration of Christ as portrayed in the Image of Divine Mercy, and the Feast Day of Divine Mercy recently declared by Pope John Paul II. It is hoped that this little book will serve as an effective introduction to one of our world�s more recent spiritual masters. May these quotes and short sayings find a place in your heart and soul, and draw you closer to Our Lord Jesus Christ, who St. Maria Faustina loved and served so well.